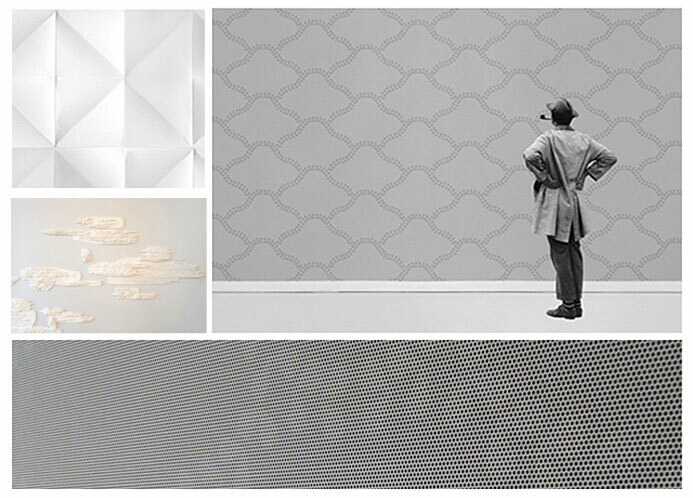 To mark the occasion of the fifth edition of WallpaperLab exhibited at UCAD, Plume Voyage magazine offers a quick overview of the most creative wallpaper designs of today. Drawing inspiration from the tradition of the decorative arts, line drawing and the kinetic treatment of surfaces, they all evoke new visual landscapes. We urge you to follow their lead – push back the walls and be creative! Playing optically on the perception of space, wallpaper designs are steadily becoming more creative to add dimension to the space around us. Devised for A3P (Association for the Promotion of Wallpaper) by designer Benjamin Graindorge, the collective of Les Graphiquants, gallery-owner Sophie Costamagna and photographer Denis Darzacq, the textures that are projected onto our walls make up a very singular expression. It was a game of kinetics for Ionna Vautrin – the first prize winner – who disturbed the flat surface with thousands of peas, and an illusion of folds and geometric abstraction in shades of gray for Les Graphiquants, the second prize winners. Entitled ‘Blanc sur Blanc’, their vision of wallpaper “plunges us into an inspiration of the polar region at a time when global warming is a major issue. Inspired by the panoramic of Zuber, “the land areas” (1862), it reinterprets the concept of discovering new landscapes: the concept of white on white is not visible to the naked eye, and so everything is a matter of details. For, by assembling pieces of pre-cut paper, a shape is created,” explains A3P (Association for the Promotion of Wallpaper). Composed of Cécile Figuette and Frédéric Bonnin, designers and manufacturers, Minakani Lab designs collections of exceptional wall décor. Guided by their passion for pattern and color, their imagination borrows from the world of childhood and dreams, literature and travel, Scandinavian and Japanese imagery, the two most inspiring landscapes. A cloudy sky, giant peacocks, stylized lightning and the darkened peaks of the Carpathians make up their theatrical scenery. 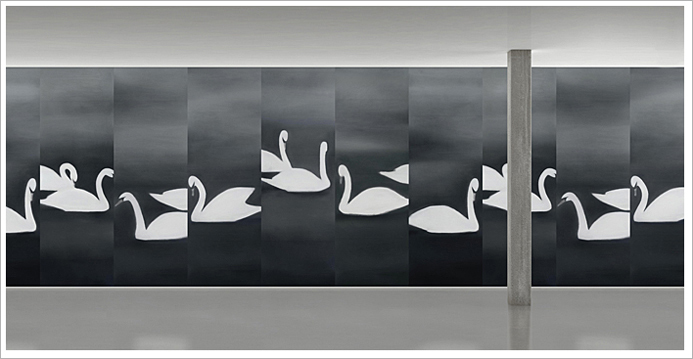 Developed in their Parisian workshop, each mural tells a refined and fantastic, surprising and poetic story. Vincent Darré, the elegant dandy of Parisian life, who holds court in his cabinet-de-curiosités gallery located a few steps from Place Vendôme, needs little to no introduction. However, this time we are looking across town to celebrate a new collaboration with the Maison Frey – displayed in the patio of the Hôtel Prince de Galles and in the Pierre Frey showroom – for which Darré designed a capsule collection of six designs on printed cotton. As they are not wallpaper exactly, these elegant designs could be nicely suited as wall hangings too. “By immersing myself in the archives of the house, I discovered a multitude of extraordinary designs made by various artists from the 40s, a fascinating period of Decorative Arts where the craziness of Baroque became embroiled in a mythological allegory. 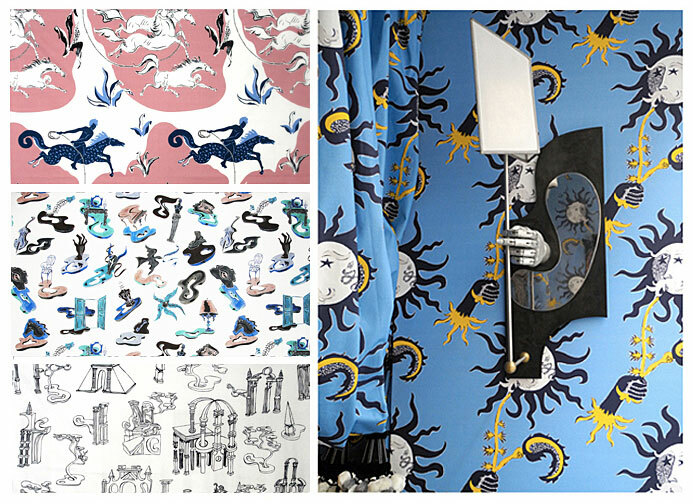 I fell in love with these prints and the idea of this collaboration turned into a tribute to this historical magic: to choose three archives and make three drawings in response to them,” explains Vincent Darré. Drawing from their English heritage, the manufacturers of Timorous Beasties and Farrow & Ball draw on tradition to create lush landscapes and vintage settings, which stimulate new images. Birds of paradise and colorful butterflies, the evocation of an urban chaos and London scenes that are reminiscent of the heyday of the French Toile de Jouy…these are all the timeless tableaux that populate the universe of this Glaswegian manufacturer. In turn, Farrow & Ball – as experts on color – explore subtle foliage and the accumulations of stamens, footprints on floors and freshly painted wide vertical stripes to stand interiors in good taste. Finally, children now have access to a creative universe tailored especially to them. A Parisian decorative painting atelier specializing in children’s rooms, Bartsch is making the traditional skill fashionable again by imagining the most beautifully poetic collections. 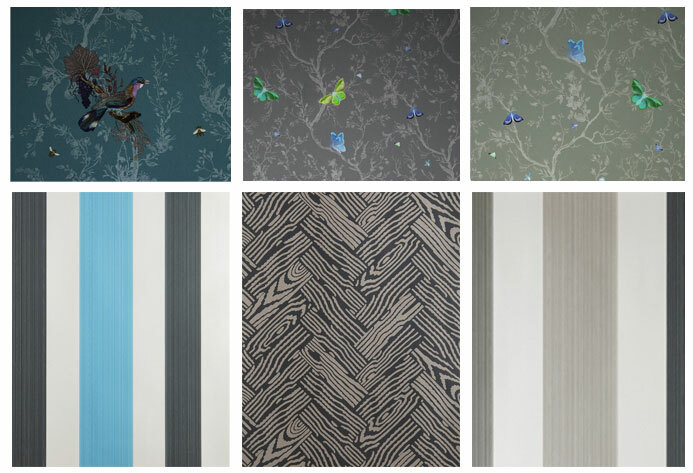 Amongst other things, Bartsch has put on walls: pastel cotton clouds, oversized Vichy stripes, moon crescents and dandelions in rose sandalwood, mustard and smoky blue. 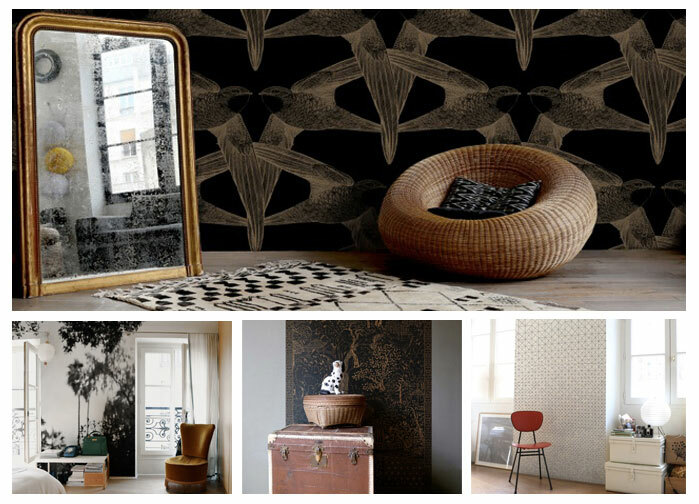 A contemporary tribute to a by-gone savoir-faire tradition, as explained by the atelier: “Bartsch wallpapers are printed on non-woven paper, according to the traditional methods developed in the nineteenth century that produce an almost ‘handmade’ artisanal result”. The 2014 Élitis collections were designed to be married and complete each other, as the brand explains: “The exuberance of each is tempered and balanced by the apparent simplicity of the others. It’s a baroque universe inspired by a place somewhere between light and dark that also has a little taste of the south. Woven wood, straw and raffia partner with quilted textiles and recall images of iodized, colorful terraces. Further on, large and heavy doors reveal a flamboyant world where walls in metal and pearl sparkle, adorned in pleated textiles”. The innovative creations of Maharam Digital Projects embellish large-scale surfaces and vast outdoor spaces like no other. Through ongoing collaborations with renowned artists, the American manufacturer (founded by a Russian immigrant in 1902) explores every graphics registers. 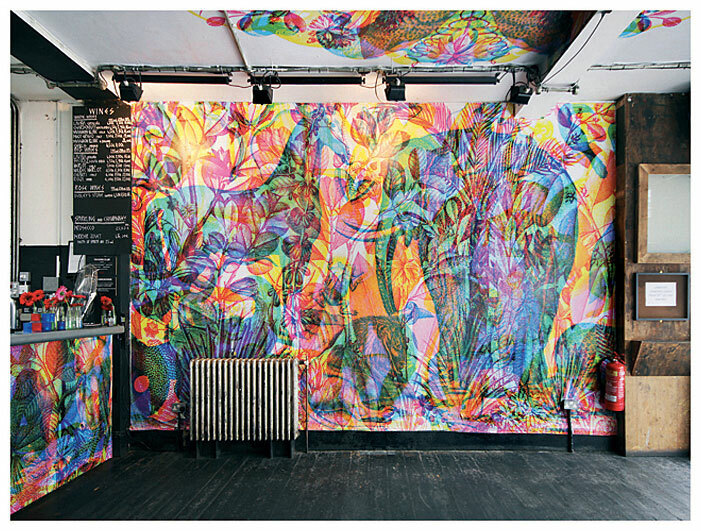 From the abstract patterns of Liam Gillick, to the unique creations of the designer Hella Jongerius and fashion designer Paul Smith, fans can also discover original pieces such as the fantastical worlds of Japanese artist Tomokazu Matsuyama and the dreamlike photographs of James Welling. A real museum-like approach.